The youths also laughed when the 23-year-old Prejean shared another unusual part of her faith journey—the moment when she set the record for the longest time it’s ever taken to scale a 50-foot-high climbing wall. Then there was the quiet appreciation that the high school students showed when Prejean mentioned the secret to life that she learned from a young saint, a secret the saint revealed on her deathbed when she shared the six words that guided her life. 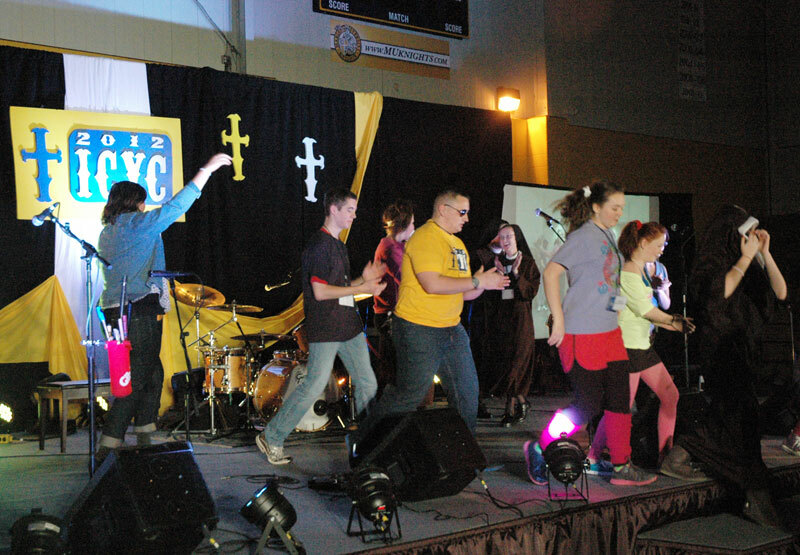 Katie Prejean related those stories as the keynote speaker of the Indianapolis Catholic Youth Conference on Nov. 4 at Marian University in Indianapolis. Taking the stage in front of an enthusiastic audience of nearly 700 youths from the Archdiocese of Indianapolis and the Diocese of Lafayette, Ind., Prejean showed the teenagers how even the ordinary moments and seemingly different people we meet can sometimes help lead us to a deeper relationship with Christ. To the delight of the teenagers, the youth minister and high school religion teacher from Louisiana illustrated that point in her story about the guy with the unusual tattoo. She recalled how she stood behind the man as they waited to pay for gas, awkwardly staring at the tattoo. Trying to make sense of its meaning, she wondered if it was some kind of drug reference. Then the man turned around, caught her staring at him and shared the origin of the tattoo. “He smiles and says, ‘You are the light of the world. You are the salt of the earth.’ Look it up. It’s the Gospel of Matthew,’ ” Prejean recalled. She looked it up. She found the words in Matthew, Chapter 5, verses 13-16. Yet, Prejean acknowledged that greatness was the last thing on her mind when she was a high school senior on a spiritual retreat that involved climbing a 50-foot-tall wall. She just wanted to survive. As she looked for a way to avoid the climb, a fellow student encouraged her. Then when she finally neared the top, a burly man reached down from atop the wall and pulled her up the last few feet. “I still hold the record of taking the longest time to climb the 50-foot-wall—57 minutes,” Prejean proudly noted to the youths, who cheered in response. She then shared how the climb was just part of the adventure. The second part involved riding a zip line through the forest at the retreat center. The same man who pulled her to the top of the wall encouraged her to push off on the zip line twice. Both times, she stayed put. The third time that he encouraged her, he also pushed her off the platform. “Your faith is a journey,” Prejean said. “It’s a process where you are getting to a point where you can literally launch yourself into the arms of God. You are never going to reach a point in your faith where you cannot believe more. She finished her talk with a story about St. Thérèse of Lisieux. Prejean repeated those words a few times to the youths. It’s a love that God offers us as his people, Prejean said. Father Patrick Beidelman shared a similar message with the youths in his homily during the closing Mass of the conference. “In the face of our transcendent God, who is one and who desires to be one with us, our only response is holy, single-minded, wholehearted love,” said Father Beidelman, director of liturgy for the archdiocese and vice rector of Bishop Simon Bruté College of Seminary in Indianapolis.